Created by Uncle Emilio and his Cousin’ Tonio… Deep fried, sprinkled with Southwestern seasoning and served with Marinara sauce for dunkin’. A zippy, cheesy ‘n creamy Chili con Queso made with Jack, Cheddar and Cream Cheeses blended with Jalapeno ‘n Chipotle Chilies and topped with a “dollop” of Pico de Gallo; served with Corn Tortilla Chips. Our zesty Beef ‘n Bean Chile. Cup or Bowl. 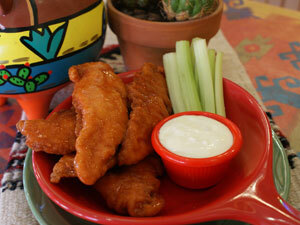 Sam’s recipe from Taos, New Mexico. Made with Pork and Green Chilies. Cup or Bowl. 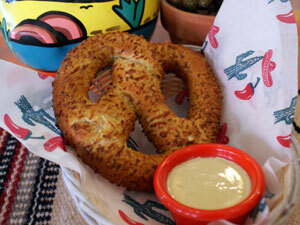 Beer Battered Onion Rings dusted with Rosita’s Southwestern Spices and served with BBQ sauce for dippin’. A “Basket ‘O’” golden Sweet Potato Fries, served with Chipotle Sour Cream. Yummy! Roasted with Sam’s Original Habanero Chile Marinade. Served with Ranch Dressing. Small or Large Order. 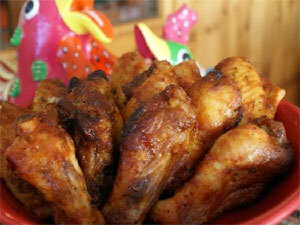 A great combo of BBQ Baby Back Ribs and Habanero Chicken Wings. 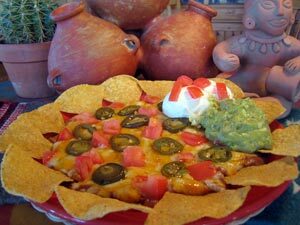 We add Guacamole and Sour Cream to make them “El Supremo”. Mild and simple. A fried Flour Tortilla covered with melted Monterey Jack ‘n Cheddar cheeses. Small or Large. Sam’s traditional Red sauce, seasoned Ground Beef, Jack ‘n Cheddar Cheeses, Black Olives and mild Green Chilies baked on two fried Flour Tortillas.